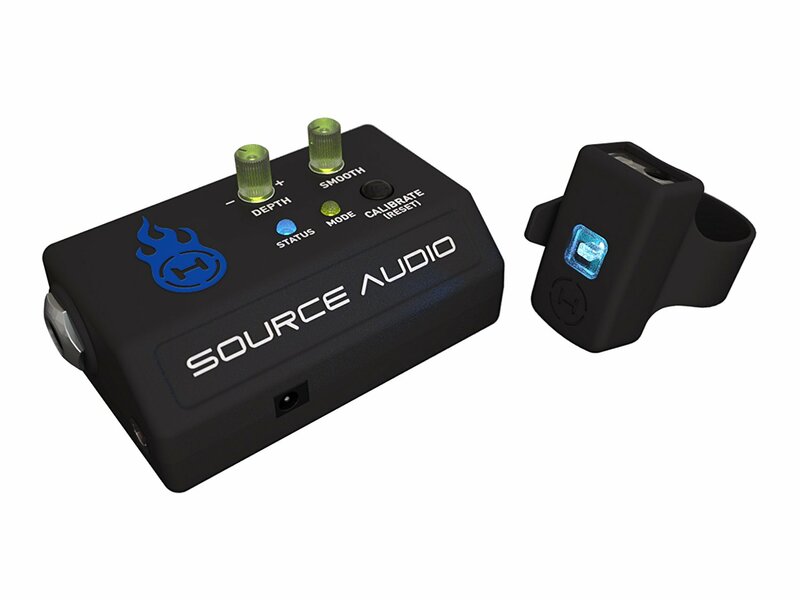 Source Audio is an American manufacturer of guitar and bass effects, who has a new and exciting holistic approach to what an effect pedal can be. Because most people feel slightly intimidated by devices that look unfamiliar, Source Audio has chosen to give their One Series pedal range a familiar stompbox look. These pedals may look like regular floor effects, but there much more going on than meets the eye. Source Audio’s basic philosophy could be summed up as ”maximum flexibility and maximum controllability coupled with the best possible audio quality”. Despite their deceptively simple looks the Series One pedals offer such a large range of tonal options that a review, such as this one, can only give you a little glimpse at all the available options. 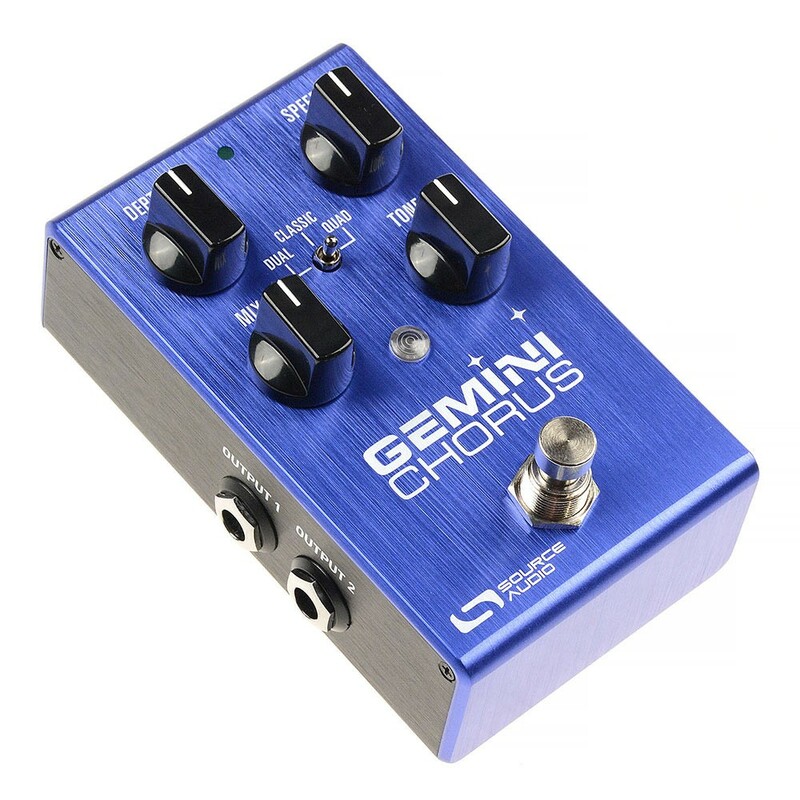 The Source Audio Gemini (current price in Finland: 152.15 €) comes across as a traditional chorus pedal. As a physical stand-alone device the Gemini offers you a choice of three different chorus modes – the vintage-style Classic mode, the fatter Dual mode, and the very lush Quad mode. 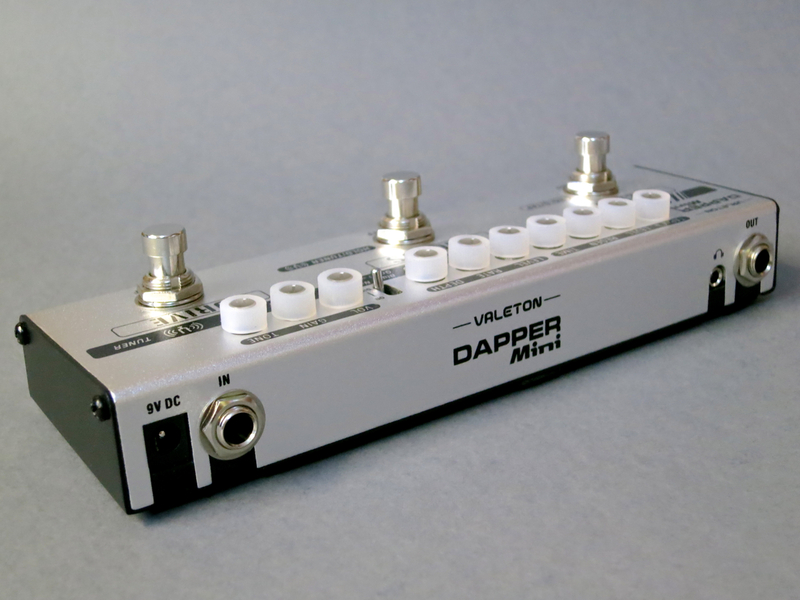 In addition to the regular knobs for Depth and Speed, there are also controls for Tone and (Effect) Mix. 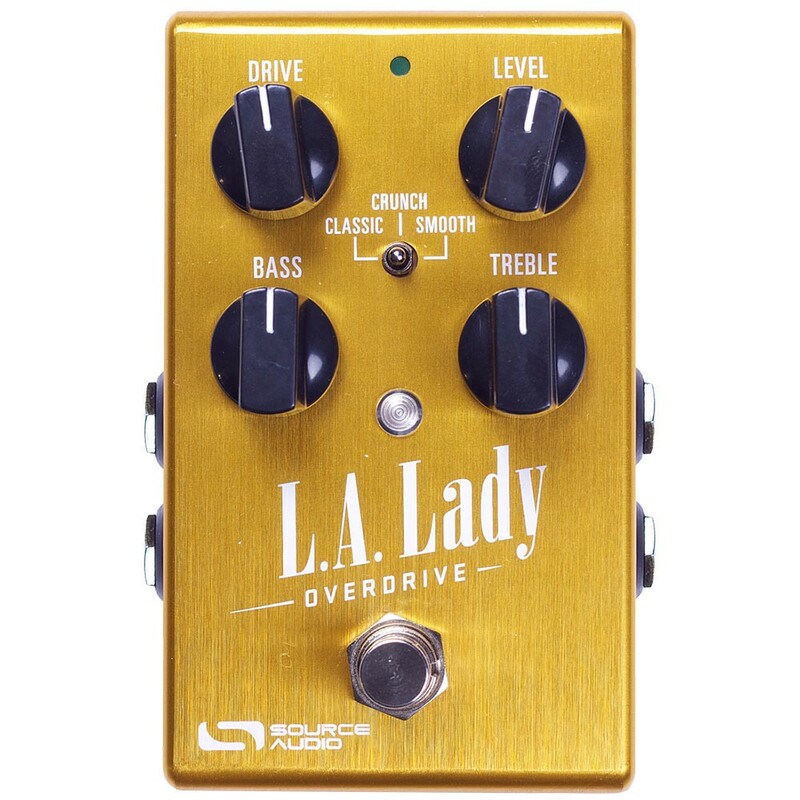 The One Series’ overdrive pedal is called LA Lady (152.15 €). 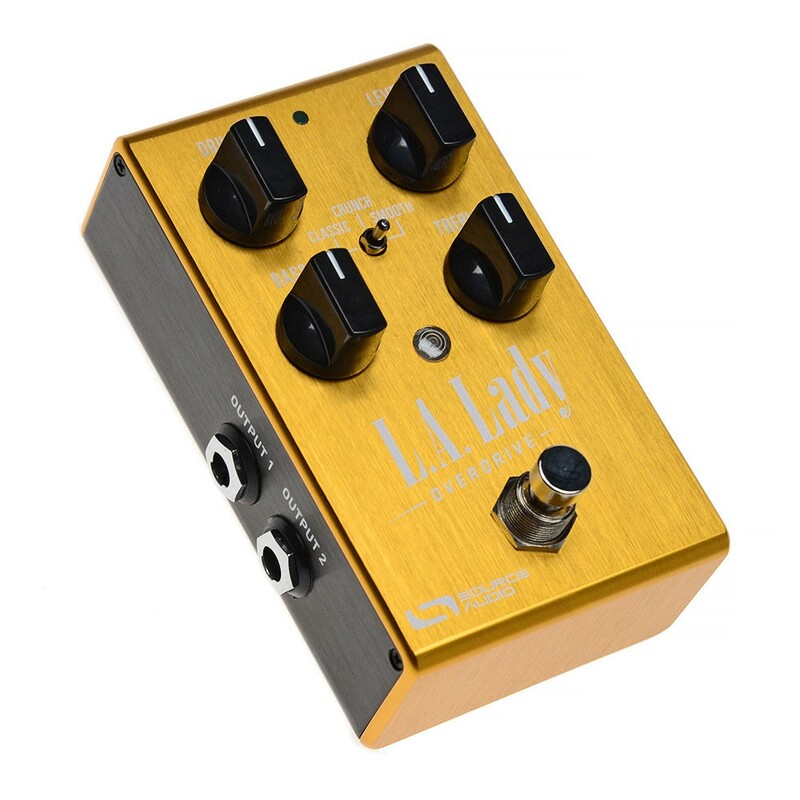 The LA Lady, too, comes with three different overdrive flavours – Classic, Crunch, Smooth – and four controls (Drive, Level, Bass, and Treble). The larger size, as well as the number of different controls, of the Source Audio Nemesis delay (296.65 €) already hints at the wide array of options available. As a stand-alone unit you can chose from 12 different delay-types, with algorithms ranging from the traditional (Slapback or Analog) to the far-out (Helix or Shifter). 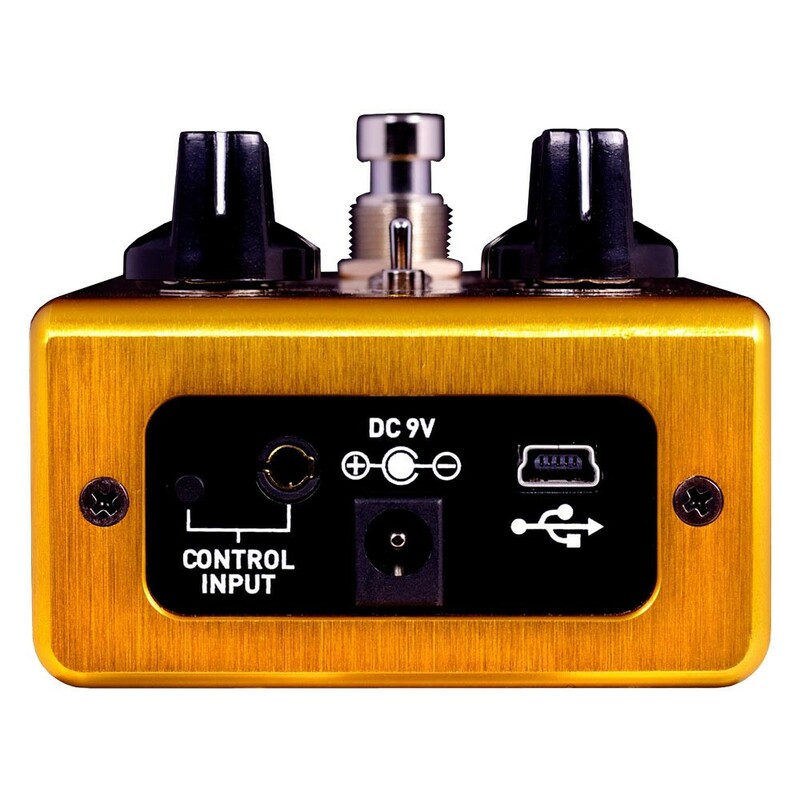 Three controls adjust the main delay parameters (Time, Feedback, Mix), and another set of three knobs control the pedal’s modulation section (Mod, Rate, Intensity). In addition to the On/Off-switch there’s also a footswitch for the Tap Tempo function. The corresponding mini-switch lets you choose from three different tap tempo divisions (quarter notes, dotted eighths, and eighth triplets). The Nemesis’ preset memory has been placed between the footswitches. You can store eight preset patches for fast recall. 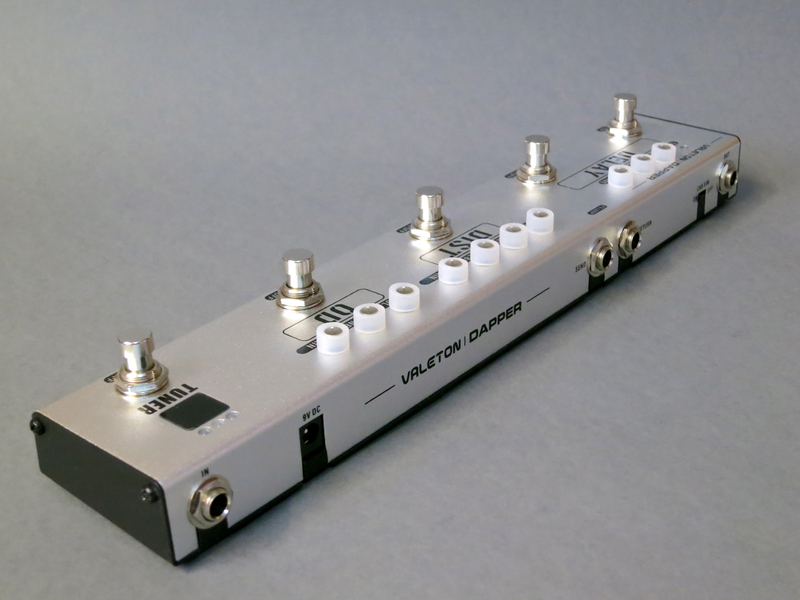 All One Series pedals are true stereo effects, meaning they can process and output stereo signals. The stereophonic effect signal isn’t just processed stereo – with the right channel being a phase reversed copy of the left channel – but there’s a real stereo spread with both channels carrying discrete signals. 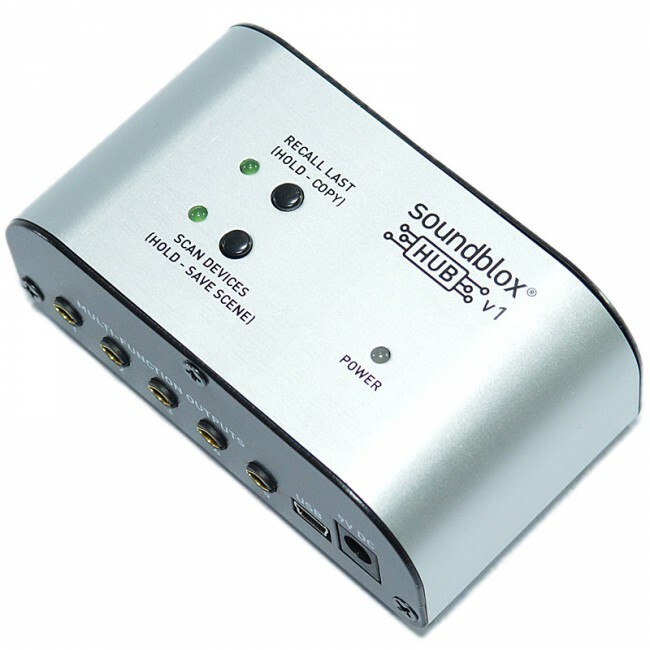 The reviewed pedals all need a power supply (included in the package) unit to work properly. 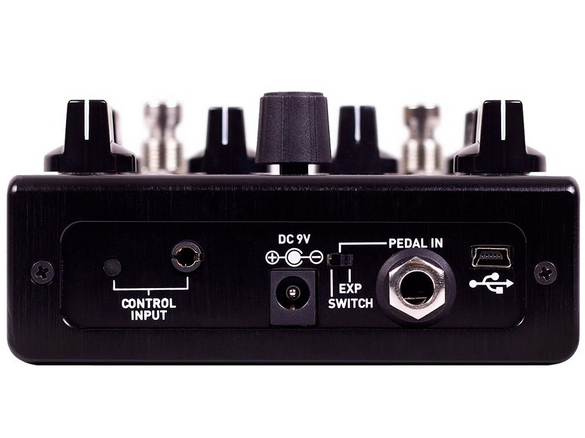 The Control Input is used by a range of different Source Audio controllers, while the mini-USB port lets you update a pedal’s firmware (Windows/OS X). 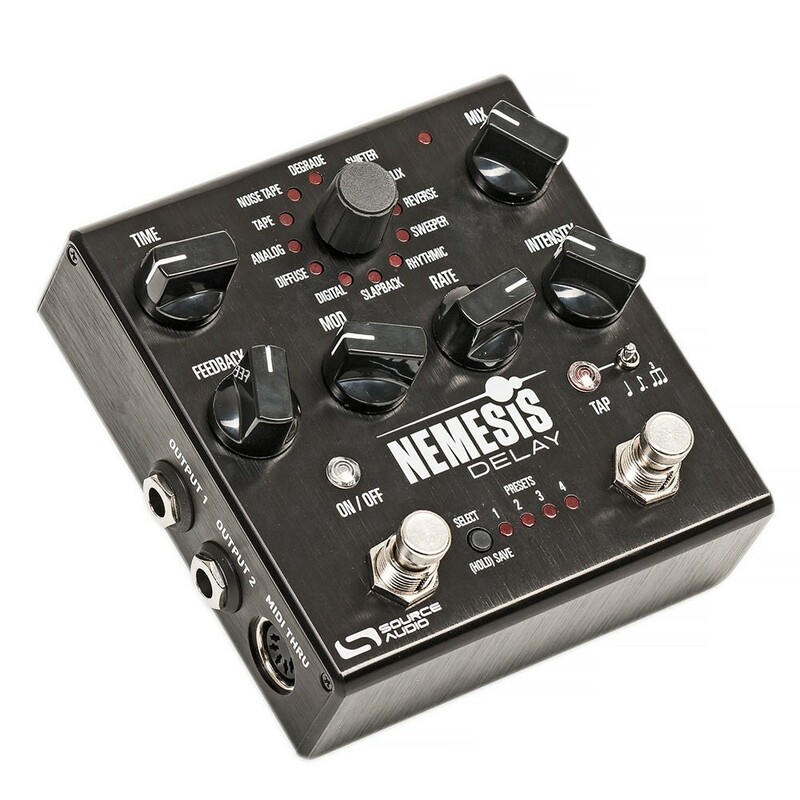 The Nemesis Delay adds a 1/4-inch Pedal In jack, which can be used with a regular expression pedal for preset switching. There’s also full MIDI-implementation on the Nemesis. As I’ve mentioned at the beginning, what can be seen from the outside is only the tip of the proverbial iceberg. In reality each of these Source Audio effects is fully-fledged digital effects processor, specialising in a certain effect type, and the user can access and adjust any parameter, even in real time, using a mobile device or one of Source Audio’s range of controllers. 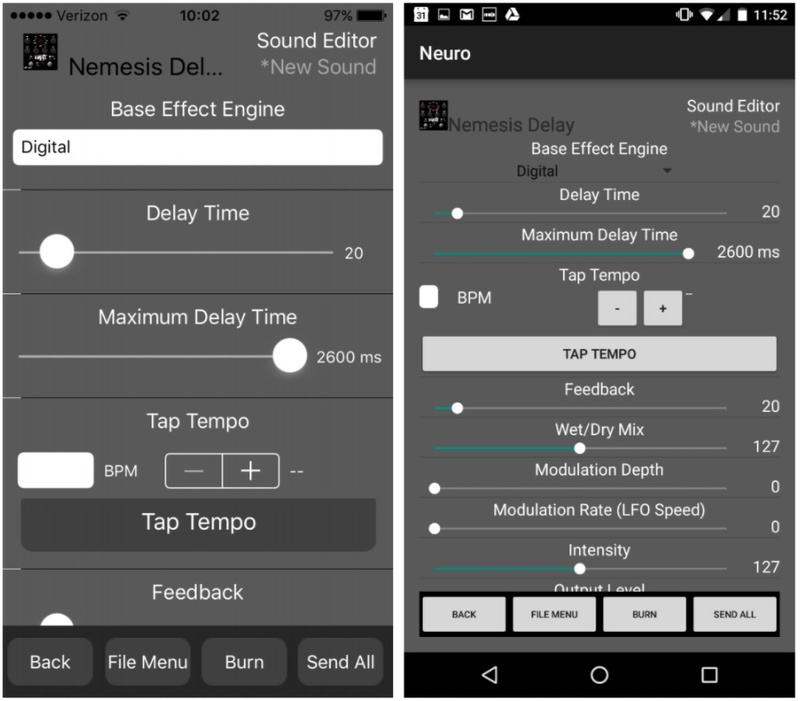 Using Source Audio’s free Neuro-app gives you full access to all of the parameters inside the pedals from your Android- or iOS-running mobile device. A special cable is included with each pedal that plugs into your phone’s (or tablet’s) headphones output and the right channel input of your One Series pedal. If you use several Source Audio pedals on your pedalboard, there’s no need to plug into each one separately, because you can connect to any One Series pedal in your signal chain simply by plugging into one of the pedals. Still, you can only remote control one pedal’s parameters at any given time. 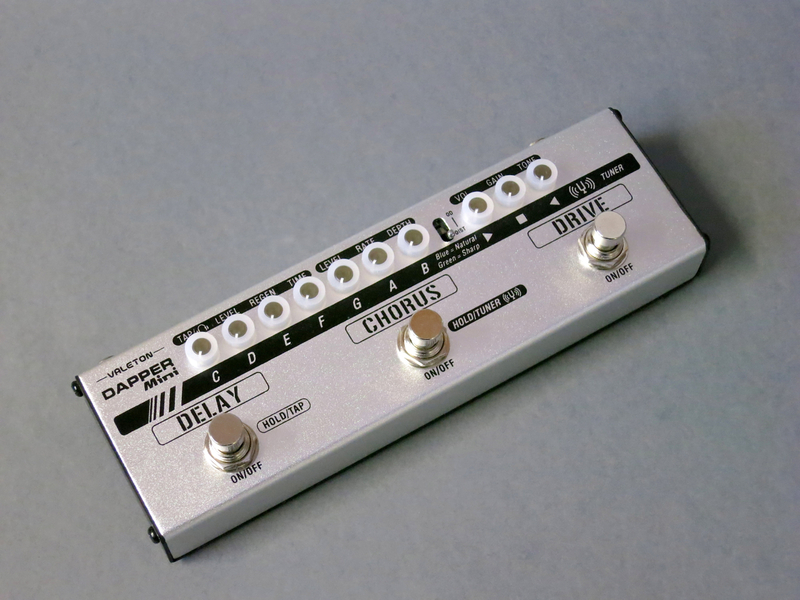 You have to select the pedal you want to edit, before you can perform the parameter changes. Despite the large number of different parameters on offer Source Audio’s Neuro is surprisingly easy to use. Personally, I do prefer using a tablet, because of the larger display, but a smartphone will work fine, too. In the Gemini Chorus’ case, Neuro will give you access to such parameters as effect algorithm, additional tremolo, low-pass filter, modulation type (sine, square, dynamic filter), and the parametric 4-Band EQ. Thanks to the open architecture of the Series One pedals, the Neuro-app enables you to use (and edit) patches of the model range’s other modulation effects (the Lunar Phaser and the Mercury Flanger), too, turning the chorus pedal into a phaser or flanger. There are even more editable parameters offered in the LA Lady overdrive than in the Gemini chorus using Neuro, but the most interesting one surely must be the access to a second ”overdrive engine”. The two engines can run two different overdrive types simultaneously (with options ranging from vintage fuzz to modern distortion), and each engine can then be adjusted with things like EQ. You can choose from a range of different signal routings using the I/O Routing Option menu. In addition to different mono and stereo input and output options, you can also decide whether to run the two overdrive engines in parallel or in series. Using the Neuro-app let’s you turn your LA Lady into a different One Series drive effect (the Kingmaker Fuzz and the Aftershock Bass Distortion). 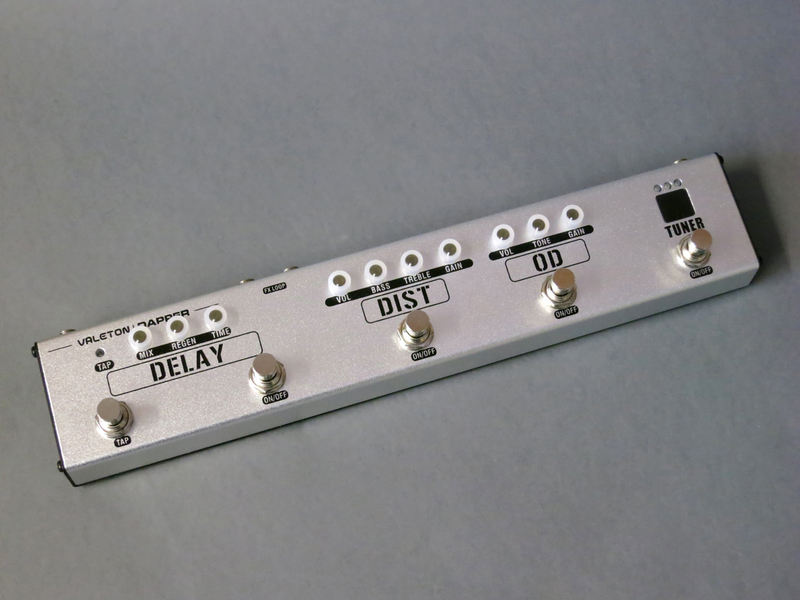 Using Neuro will double the available number of delay-types in the Nemesis Delay from 12 to 24. 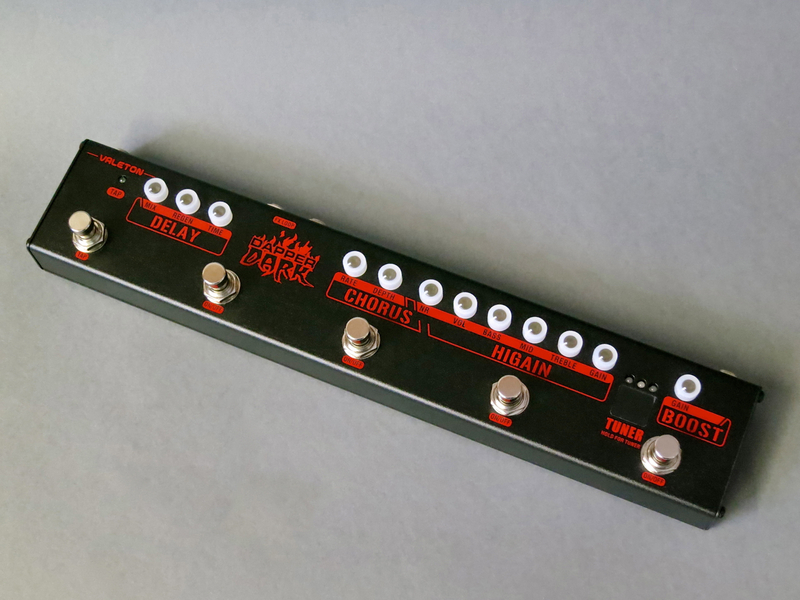 The additional delays include complex multi-tap rhythms (Complex Rhythmic), wildly pitch-shifting repeats (Compound Shifter), and a number of low-fi and vintage options (Oil Can, Lo-Fi Retro, Warped Record, Binson). Additional internal parameters include things, such as the tone of the feedback signal, the sweep filter, or the distortion and noise levels of a tape echo. 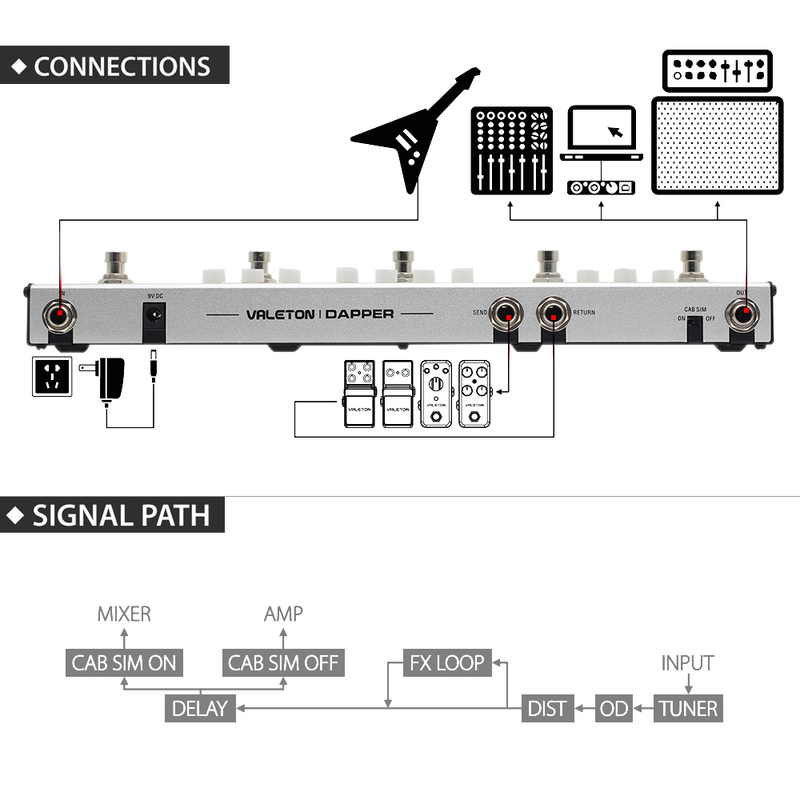 The Nemesis, too, offers you a number of different signal routing options. The Neuro-app isn’t the only way to control Source Audio pedals. 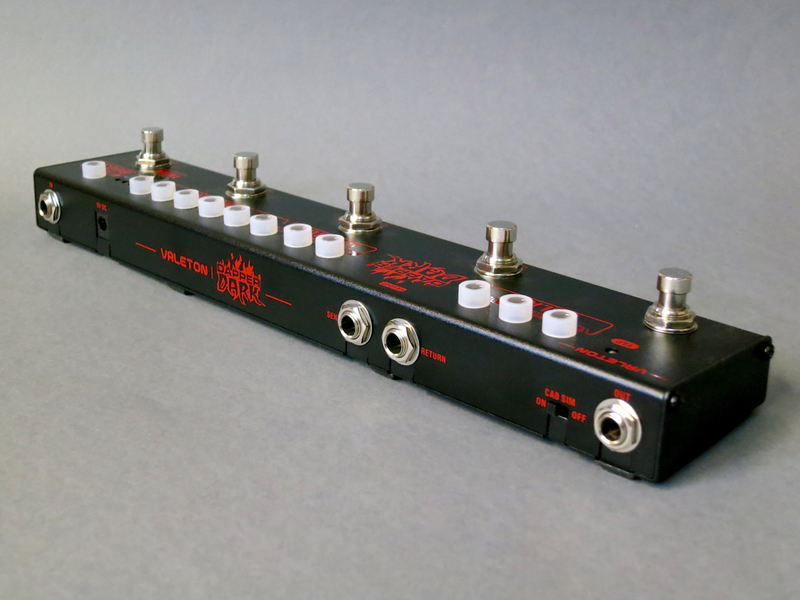 The Hot Hand 3 controller uses a special ring for parameter control. The ring senses 3D-movement and has a transmission range of 30 metres. 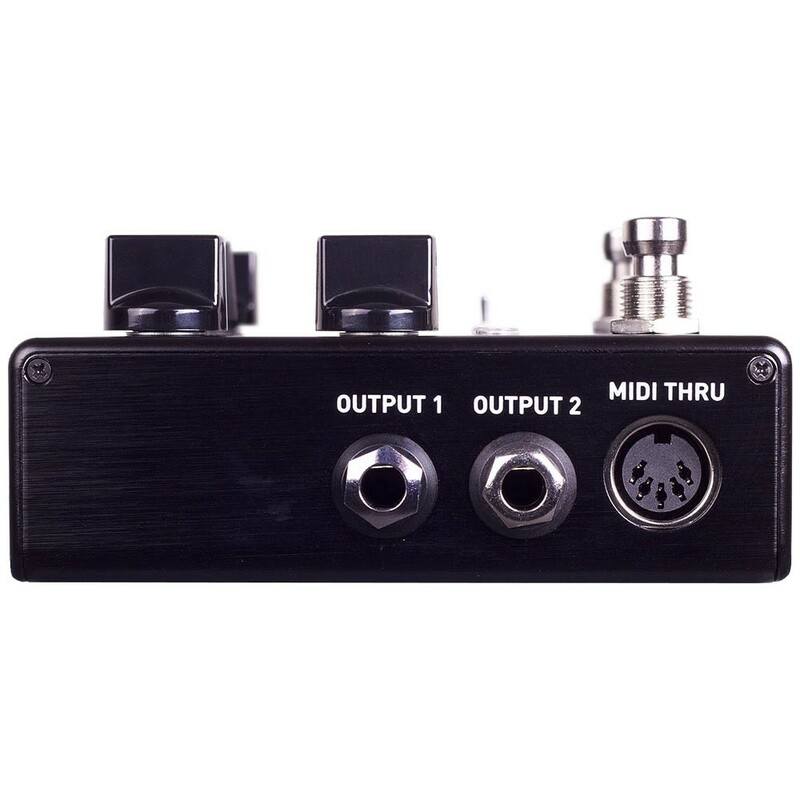 The Neuro Hub is Source Audio’s very compact switcher that allows you to store up to 128 different sets (so-called scenes) of patch settings of up to five Source Audio effect pedals. The scenes stored in the Neuro Hub can be recalled on the fly, for example via MIDI. The Hub Manager software (Windows, OS X) lets you adjust scene settings and patches using a computer connected to the USB port. 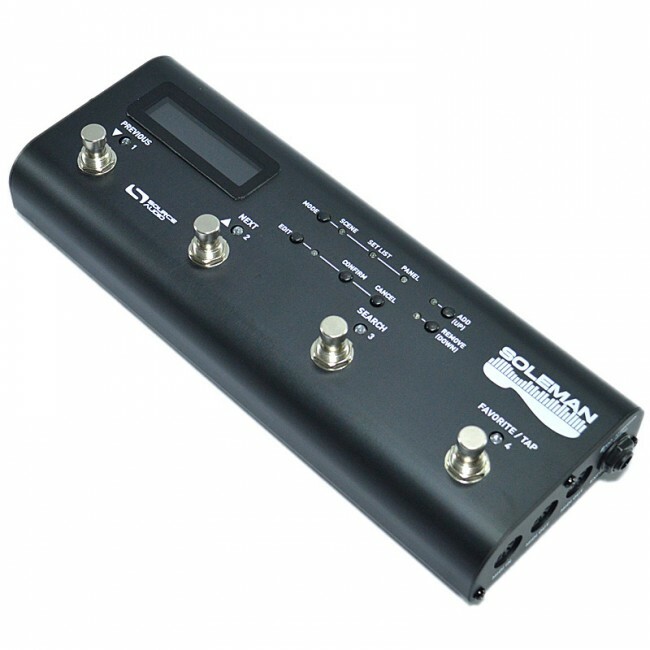 Source Audio’s MIDI-switcher is called the Soleman. Source Audio’s holistic and open approach to effect pedals is so all-encompassing, that a review article, such as this, can only scratch the surface of what is possible. I’m sure I could have spend a few weeks more with these pedals, without ever becoming bored. This is a cool trio of effects, even straight out of the box. 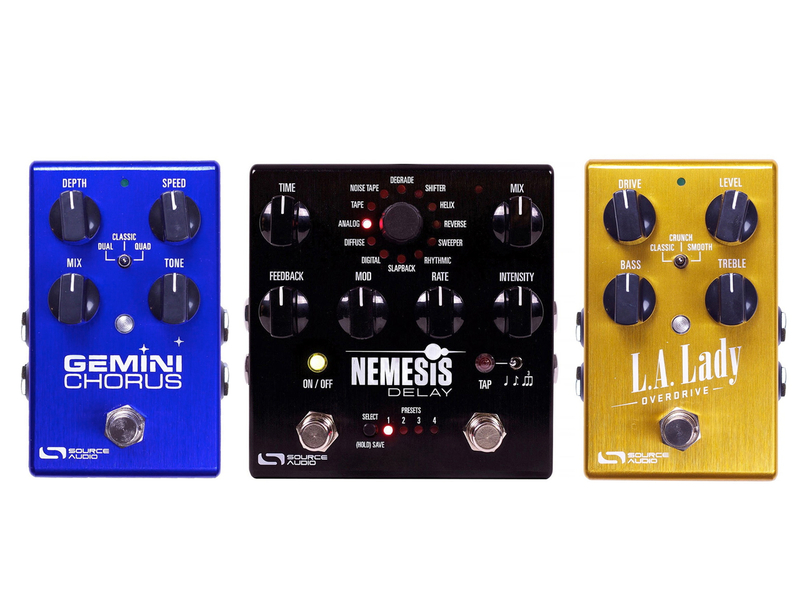 The Gemini Chorus and the LA Lady Overdrive both offer three different effect modes and plenty of scope for quick adjustments. 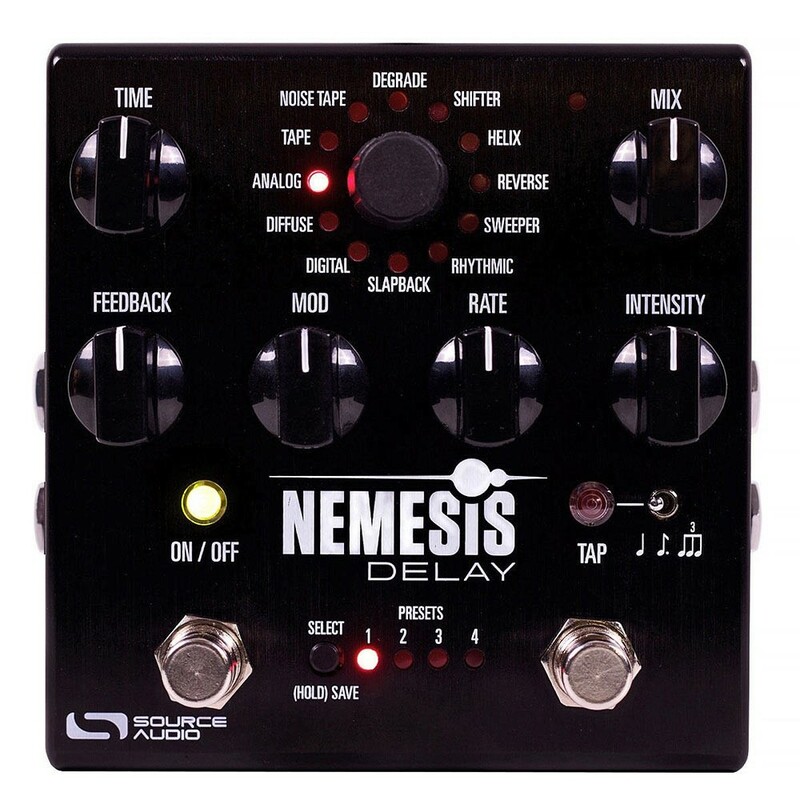 Even as a stand-alone unit the Nemesis Delay is something of a flagship delay pedal, with its 12 delay-types, its modulation section, and the internal preset memory. 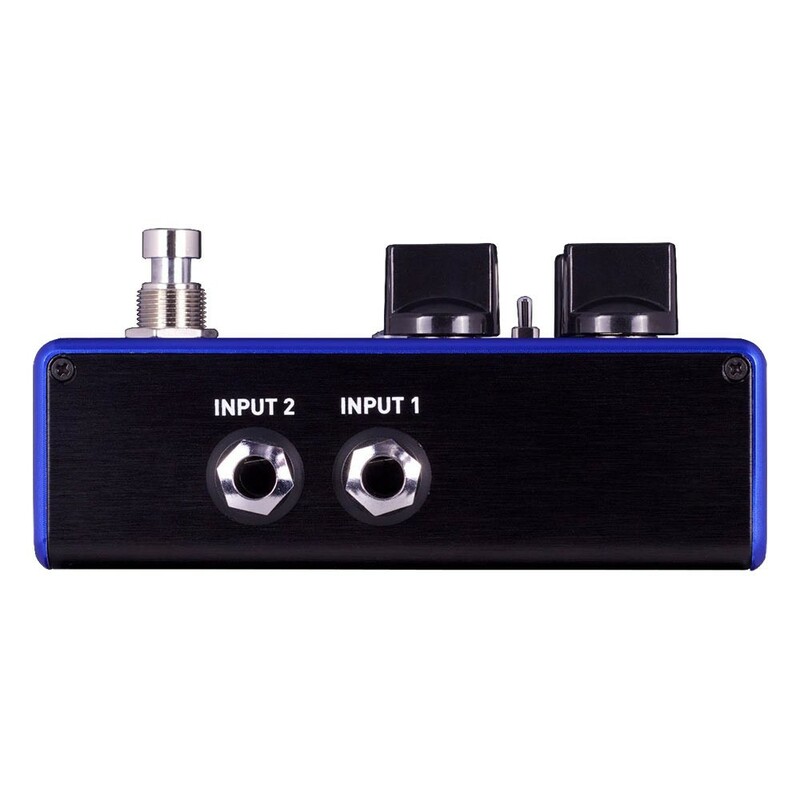 Many users would already feel satisfied by these three pedals as they are, because they are easy to use and sound terrific. Source Audio on amerikkalainen kitara- ja bassoefektien valmistaja, jolla on uudenlainen ja kokonaisvaltainen lähestymistapa efektipedaaleihin. Koska ihminen usein vierastaa asioita jotka tuntuvat vieraalta, Source Audion digitaaliset One Series -pedaalit näyttävät ulkoisesti täysin tavallisilta, perinteisiltä efektipedaaleilta. Todellisuudessa kuitenkin One-sarjan pedaalien fyysinen ulkokuori on vain jäävuoren huippu, ja pinnan alta löytyy asian ydin. Ominaisuuksien ja käyttömahdollisuuksien suhteen Series One -pedaalien tarjoama skaala on niin valtavan laaja, että tällainen testi voi vain hieman raottaa ovea Source Audion ihmeelliseen maailmaan. 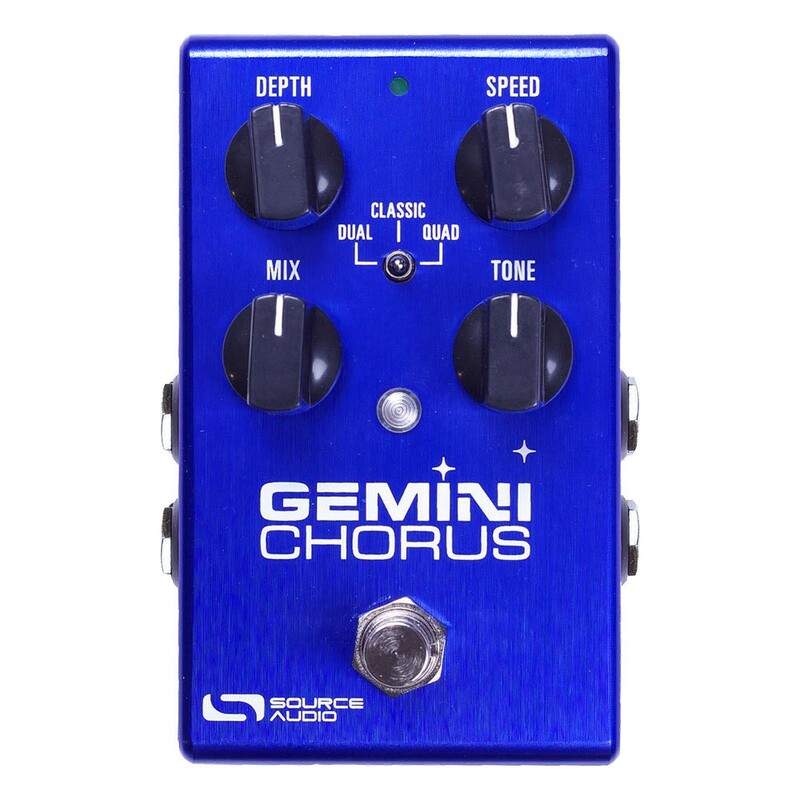 Source Audio Gemini (152,15 €) vaikuttaa ulkoisesti melko tavalliselta chorus-pedaalilta. Fyysisessä standalone-laitteessa on valittavissa kolme eri chorus-moodia – vintage-tyylinen Classic, hieman täyteläisempi Dual, sekä todella muhkea Quad. Tavallisten choruksen syvyys- ja nopeussäätimien lisäksi tarjolla on Tone- ja Mix -säätimet, joista jälkimmäisellä säädetään kuivan ja efektoidun signaalin suhdetta. LA Lady (152,15 €) on One-sarjan overdrive-pedaali. Myös LA Ladystä löytyy kolmiasentoinen moodikytkin eri särötyyleille (Classic, Crunch, Smooth), sekä neljä säädintä (Drive, Level, Bass, Treble). Source Audion Nemesis -pedaalin (296,65 €) isompi fyysinen olemus antaa jo ymmärtää, että sen mustan kuoren alla tapahtuu mielenkiintoisia asioita. Standalone-laitteena Nemesis tarjoaa peräti 12 eri viive-efektiä, perinteisestä Slapbackista ja Analogista vahvasti efektoituihin moodeihin kuten Helix ja Shifter. Kolme säädintä ohjaa laitteen delayosaston parametreja (Time, Feedback, Mix) ja toinen kolmikko on omistettu modulaation säätämiselle (Mod, Rate, Intensity). Päälle/pois-kytkimen lisäksi pedaalista löytyy Tap Tempo -jalkakytkin. Asetetun tempon saa jaettua eri tavoin kolmiasentoisella pikkukytkimen asennon mukaan. Vaihtoehdot ovat neljäsosa, pisteellinen kahdeksasosa, sekä kahdeksasosatrioli. Kytkimien väliin on sijoitettu Nemesiksen efektien pikavalinta, johon voi tallentaa kahdeksan eri itsetehtyä esiasetusta. Kaikki One Series -pedaalit ovat aidosti stereofonisia, mikä tarkoittaa Source Audio -efektien tapauksessa sitä, että kuiva ja efektoitu signaali ovat molemmat aidosti stereona. Kyse ei siis ole pelkästään lähtösignaalin vaiheen kääntämisestä tai efektisignaalin edestakaisesta panoroinnista, vaan vasemmasta ja oikeasta kanavasta voi kustakin tulla oma, itsenäinen signaalinsa. Kaikkia kolmea pedaalia voi käyttää ainoastaan virtalähteen varassa (kuuluu pakettiin), sillä ne tarvitsevat toimiakseen vakaata sähkösyöttöä. Control Input -tulo on Source Audion omia kontrollereita varten, kun taas mini-USB:n kautta pystyy päivittämään efektin firmwaren (Windows/OS X). Nemesis Delay tarjoaa näiden lisäksi vielä täysikokoisen Pedal In -jakin ekspressiopedaalia tai presettien vaihtokytkintä varten. Nemesiksessä on myös valmiiksi täysi midi-integraatio. Kuten mainitsin jo jutun alussa, fyysiset pedaalit – ja niiden esillä olevat ominaisuudet – ovat Source Audion maailmassa vain jäävuoren huippu. Kukin pedaali onkin tosiassa tietyn efektityypin digitaalinen prosessori, ja käyttäjällä on mahdollisuus vaikuttaa jokaiseen parametriin – jopa reaaliaikaisesti – mobiililaitteella ja/tai Souce Audion kontrollereilla. Source Audion Neuro-applikaatiolla pääsee säätämään One-sarjan efektien kaikkia parametrejä Android- tai iOS-mobiililaitteelta käsin. Pedaalien mukana tulee audiojohto, joka kytketään puhelimen tai tabletin kuulokelähdön ja efektin oikeanpuoleisen tulojakin välille. Jos käytössä on useampi Source Audio -pedaali, mobiililaitetta ei tarvitse erikseen kytkeä jokaiseen efektiin, vaan Neuro pystyy kommunikoimaan kaikkien samassa ketjussa olevien Source Audio -pedaalien kanssa, riippumatta siitä, mihin pedaaliin puhelin on kytketty. Neurolla voi kuitenkin ohjailla samanaikaisesti vain yhtä pedaalia. Ensin valitaan muokattava pedaali, sitten tehdään siihen tarvittavat muutokset, minkä jälkeen voi halutessaan valita toisen pedaalin muokattavaksi. Vaikka parametreja ja vaihtoehtoja on tarjolla hyvinkin runsaasti, on Source Audion Neuroa yllättävän helppo käyttää. Itse suosisin ehkä tabletin käyttöä Neuron alustana, koska applikaation grafiikka näyttää isommalla näytöllä hieman selkeämmältä, mutta myös puhelimella tulee mainiosti toimeen. Neurolla pääsee Gemini Choruksen tapauksessa käsiksi esimerkiksi efektialgoritmin valintaan, erilliseen tremoloon, alipäästösuodattimeen, modulaatiotyypiin (siniaalto, kanttiaalto, dynaaminen filtteri) tai nelikaistaiseen täysiparametriseen taajuuskorjaimeen. Neuro-appsilla voi ladata myös One-sarjan muiden modulaatioefektien (Lunar Phaser ja Mercury Flanger) patchit Geminiin. Chorus-pedaalista tulee silloin phaser- tai flanger-pedaali. LA Ladyn parametrivalikoima on Neuron kautta jopa laajempi kuin Geminissä, mutta pedaalin tärkein ominaisuus on varmastikin kahden ”särömoottorin” samanaikainen käyttö. Kuhunkin moottoriin voi valita oman särötyyppinsä applikaation laajasta valikoimasta (perinnefuzzista nykyaikaiseen distortioniin), jota voi itsenäisesti muokata esim. täysiparametrisellä EQ:lla. I/O Routing Option -valikosta voi valita omaan käyttöön sopivan kytkennän. Sen lisäksi, että pedaalia voi ajaa monona tai stereona, on myös mahdollista valita, asettaako särömoottorit rinnakkain vai sarjaan. Rinnakkaiskytkennässä voi yhdistää eri särötyyppien ominaisuuksia mieltymyksiensä mukaan, kun taas sarjakytkennässä voi jälkimmäistä moottoria boostata ensimmäisellä, jolloin saadaan huomattavasti säröytyneempi lopputulos. Kuten Geminissäkin, LA Ladyssa voi Neuro-applikaation avulla käyttää myös One-sarjan muiden säröpedaalien (Kingmaker Fuzz ja Aftershock Bass Distortion) patcheja. Neuron avulla Nemesis Delayn efektialgoritmien määrää saa kasvatettua kahdestatoista 24:ään. Mukana ovat silloin myös hyvin moniulotteiset rytmiset variaatiot (Complex Rhythmic) tai villit pitch shift -soundit (Compound Shifter), sekä lisää lo-fi-soundeja (Oil Can, Lo-Fi Retro, Warped Record, Binson). Lisäparametreja löytyy esim. feedback-syötön soundin, pyyhkäisysuodattimen toiminnan tai virtuaalisen nauhakaiun särön ja kohinan säätämiseen. Myös Nemesiksessä on tarjolla monta eri signaalin reititysvaihtoehtoa. Neuro-applikaatio ei ole kuitenkaan ainoa tapa, jolla Source Audion pedaaleja pystyy ohjaamaan. Hot Hand 3 -kontrollerilla ohjataan parametreja (oikean) käden huitaisuilla. Hot Handin sormuksessa on kolmiulotteinen kiihtyvyysanturi ja sen kantama on noin 30 metriä. Neuro Hub on Source Audion pienikokoinen pedaalikomentokeskus, johon voi ladata 128 yhden tai useamman (maksimissaan viiden) pedaalin patch-asetusta (ns. skeneä). Neuro Hubin skenejä pystyy vaihtamaan lennossa esim. midi-käskyllä. Hub Manager -softa (Windows, OS X) mahdollistaa skenejen ja pedaalien asetusten muokkaamisen tietokoneelta käsin, USB-väylää käyttäen. Source Audio tarjoaa skenejen vaihtamiseen myös oman midi-kytkimensä nimeltä Soleman. Source Audion kokonaisvaltainen konsepti on niin laaja, että tämäntyylinen testi voi tarjota vain pienen pintaraapaisun aiheeseen. Olen varma, että olisin voinut jatkaa pedaalien testijaksoa vielä usealla viikolla, ilman että homma olisi mennyt pitkäveteiseksi. Tämä kolmikko tarjoaa jo suoraan paketista runsaasti vastinetta rahalle. Gemini Chorus ja LA Lady Overdrive tarjoavat kumpikin kolme erilaista efektityyppiä ja runsaasti säätövaraa laajan soundivalikoiman löytymiseen. 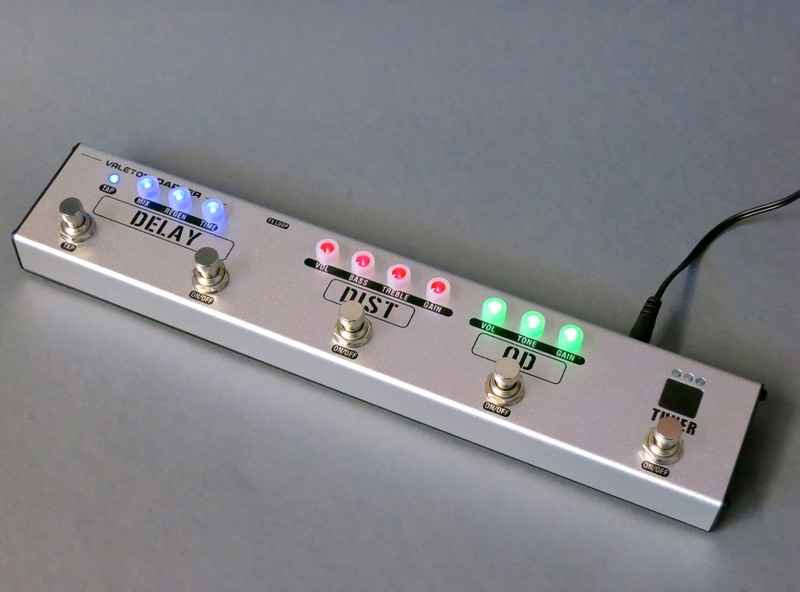 Nemesis Delay on 12 delay-tyypillään, sisäisillä muistipaikoillaan, sekä omalla modulaatio-osastollaan jo sellaisenaan todellinen lippulaivaluokan viivepedaali. Tavalliselle pulliaisille standalone-laitteiden ominaisuudetkin riittäisivät varmaan jo mainiosti, etenkin kun soundin laatu ei todellakaan jätä toivomiseen varaa. All guitar tracks recorded using the LA Lady overdrive, Gemini chorus and Nemesis delay pedals plugged into a Juketone True Blood valve amplifier (miked up with a Shure SM57).